Below are some FAQ's regarding security and satisfaction during your shopping experience. How do I know I'm safe shopping here? 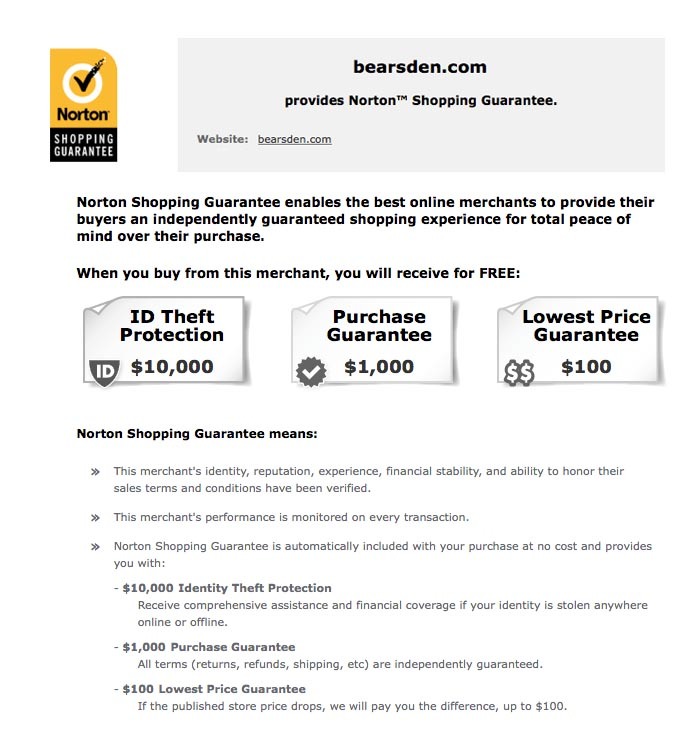 The Bear's Den is A+ accredited with the BBB & ALL online transactions are Protected with the Norton Shopping Guarantee! What does the green padlock next to "Taunton Rod and Gun" in my search bar mean? If a website has a lock beside it in search bar, then that means you’re using a secure connection. That means all data between the server (computer) the website is hosted on and your computer is encrypted. If anyone tries to snoop and see that data, it won’t make any sense to them and it cannot be used. How do I find out more about the security of a website? To learn more about how a website’s security works, you can click on that lock symbol. 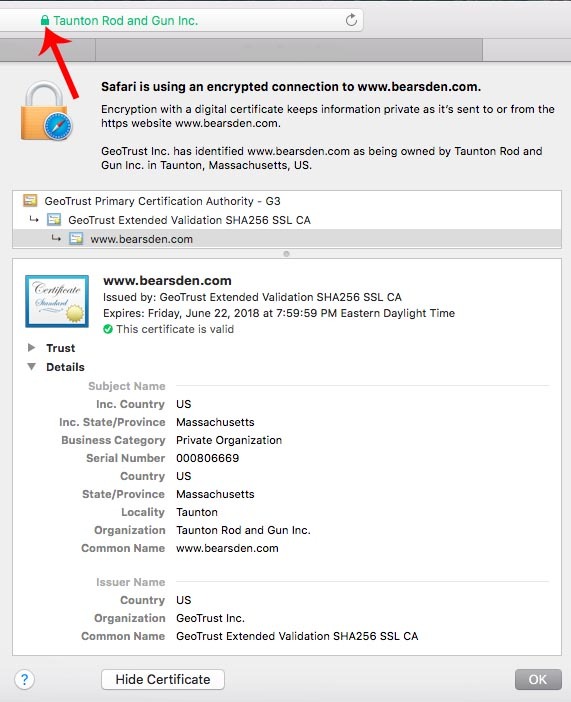 Click "Show Certificate" then on the “Details” link and scroll through. Do BBBs monitor BBB Accredited Businesses for continuing compliance with standards? Yes. Every BBB Accredited Business is monitored for continuing adherence to BBB standards. Can BBB recommend a reputable business for me to deal with? Their basic policy is to refrain from recommending or endorsing any business, product or service. This is done to ensure continued public trust in fairness. BBB Accredited Businesses must meet certain standards to qualify for accreditation and to remain accredited. You can search on their website for BBB Accredited Businesses by location and/or industry. 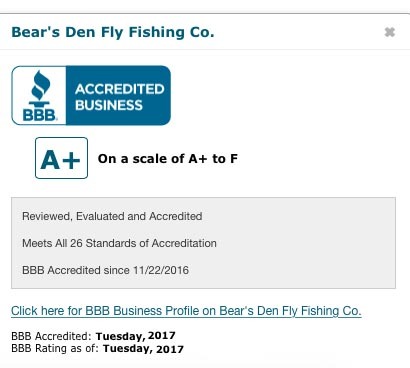 How do I find BBB information about the Bear's Den? Please click on the BBB Accredited Business badge in the lower right hand corner of the website. How do I find more information about the Norton Shopping Guarantee for the Bear's Den? Please click on the "Norton Shopping Guarantee" Button in the bottom left hand corner of the website.